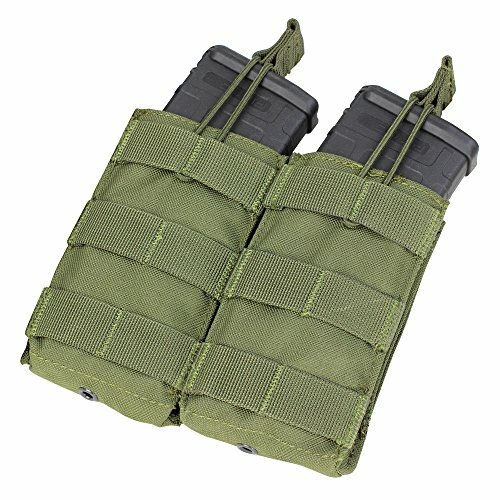 Condor double M4/M16 open top Mag pouch is a convenient modular attachment that can hold two M4 or M16 magazines comfortably and securely. This Mag pouch is ideal for tactical belts, battle belts or tactical vests since the elastic pull-tab cords make the entire pouch adjustable. Made from a durable nylon material, this pouch is tough, with riveted holes at the bottom to allow sand and other particles to drain out. Mag placement is easy and Mag retrieval is quick, as the tops of the pouch open rapidly for situations in which speed is paramount. Magazines sit securely in the spaces, making this a safe ammo holder, and there is also MOLLE webbing along the front, perfect for attaching extra gear.